Any native Detroiter knows the song. We grew up seeing it on TV & hearing it on the radio. “Tubbeeeee’s Submarines .. waaa dooo waaa” enters into your eardrums and instantly, you’re hungry. 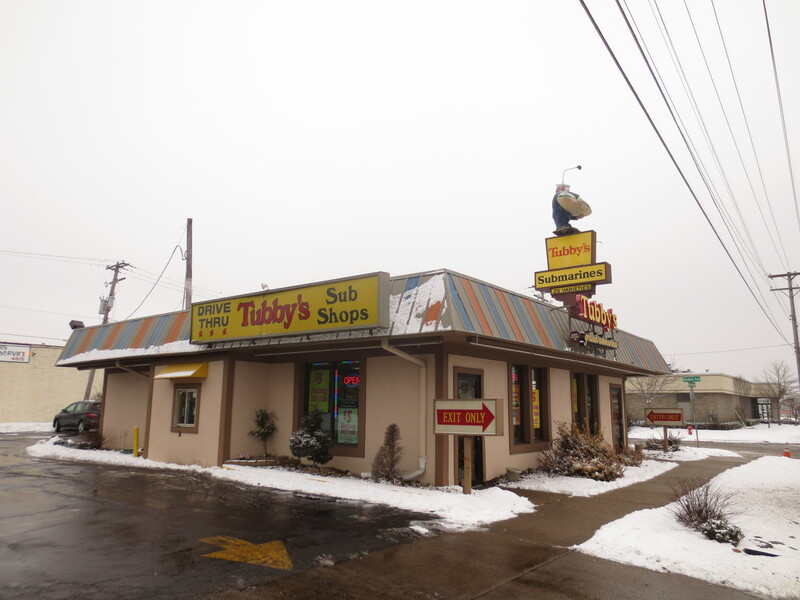 The full Tubby’s menu includes all kinds of Hot & Cold Deli Sandwiches, Soups, French Fries, Fried side items and Salads. But for me, it was all about Tubby’s Grilled Burger Subs. While on a recent business trip to Detroit, I was crusing down the street when a Tubby’s caught my eye. I slammed on the brakes, busted a u-bender & pulled in. I had to have one. 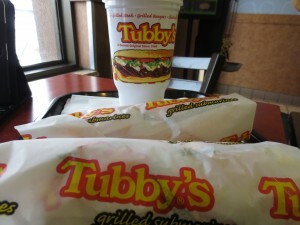 The Tubby’s Grilled Burger Subs “are made fresh with USDA Grade A hamburger beef, fresh bread, lettuce, tomatoes, onions and topped with Tubby’s Famous Dressing*.” Once you order it, a line cooke places the Beef Patty on a flat top griddle and sears the Meat. Once it’s cooked, they chop it up and place into the Bun with your choice of toppings. I always got mine the same exact way, Cheese & Dressing only. What sets this apart from any other Fast Food style Burger is the the Soft White Roll and the oh-so-tangy Dressing. It’s an oil and vinegar based sauce that has a lot of herbs and spices that place it somewhere in the Italian Dressing category. It’s unmistakable and for those fanatics, you can purchase it by the bottle. My sub was hot, tasty & delicious. 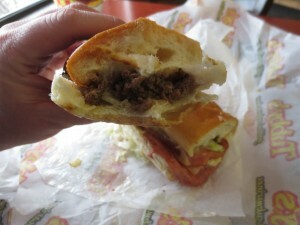 Between the Meat, the Cheese and the Dressing, my Sandwich was a tangy savor bomb served in a White Roll. 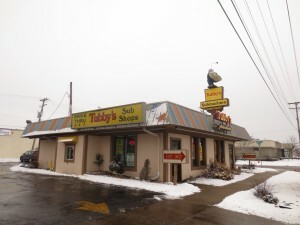 All the childhood memories I have of after school stops into Tubby’s rushed back into my head. I was glad to see that it’s exactly as I remembered. Since I knew it was going to quite sometime since I would be able to return, I also allowed myself to indulge in a Tubby’s Famous. 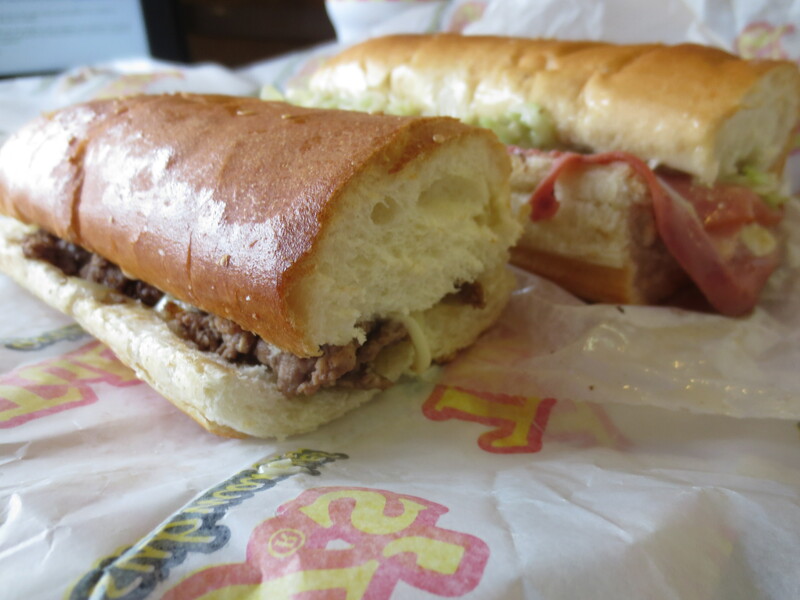 Tubby’s Subs will always guarantee a lip-licking Sandwich experience. This entry was posted in Burgers, Fast Food, Michigan and tagged best burger, burger conquest, cheese, ciancio, detroit, french fries, grilled burger subs, hamburger, michigan, nyc, rev, review, the rev meter for social community, tubbys famous dressing, tubbys sub shop. Bookmark the permalink.